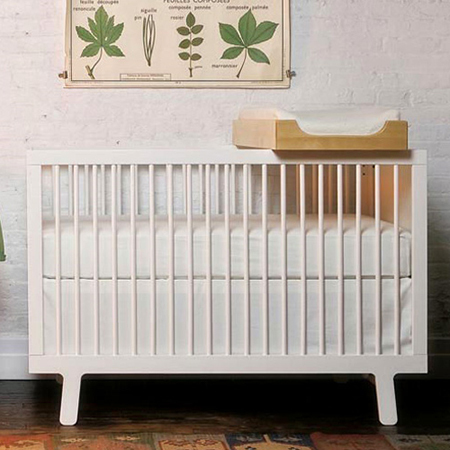 A designer crib or cot can cost anywhere from R5000 upwards. 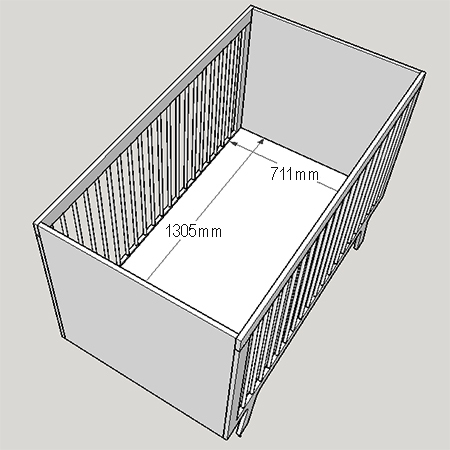 You can make your own DIY custom crib or cot at a cost of around R1200. With a bit of DIY savvy, a few power tools and 16mm SupaWood we show you how to make your own designer crib or cot at a fraction of the cost. 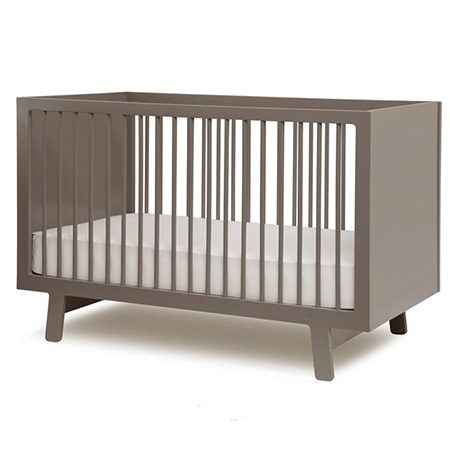 You have probably seen the Oeuf and various other modern cribs or cots on the Internet. 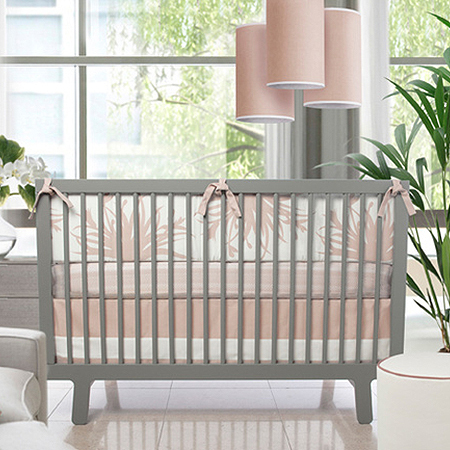 These trendy cribs retail at anywhere from R10 000 or more. 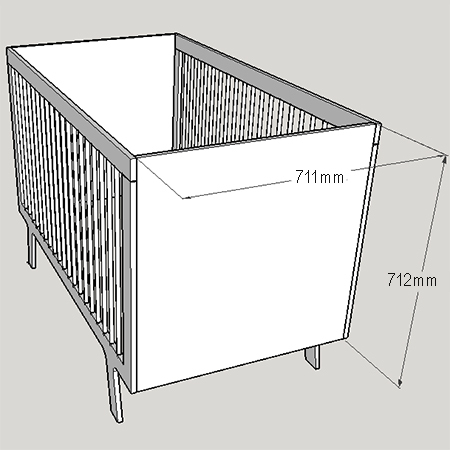 With a few design alterations and modifications you can make your own DIY crib or cot at a fraction of the cost. 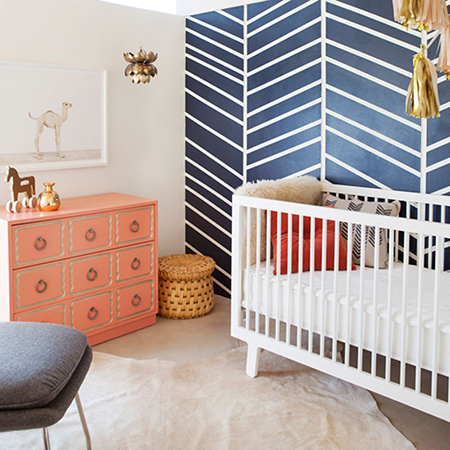 You will find everything you need for this project at your local Builders Warehouse and you can now paint the crib or cot with Plascon water-based Velvaglo enamel for a durable finish that is non-toxic, safe for children and super-easy to keep clean. 1. On the front and back sections draw a line 200mm up from the bottom. Also measure and mark out the shape for cutting out the centre. The outer frame is 60mm wide all round. 2. To cut out the leg design on the front and back, measure and mark at 150mm and 115mm and draw a line to join the two marks. Use a circular template to create a curved corner. 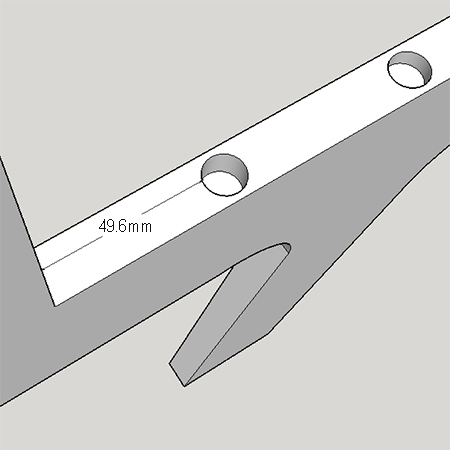 Measure in 60mm for the width of the leg, using the same template to cut a curved corner. 3. For mounting the rails place a strip of masking tape on your 12mm spade bit to allow for a 10mm cutting depth. 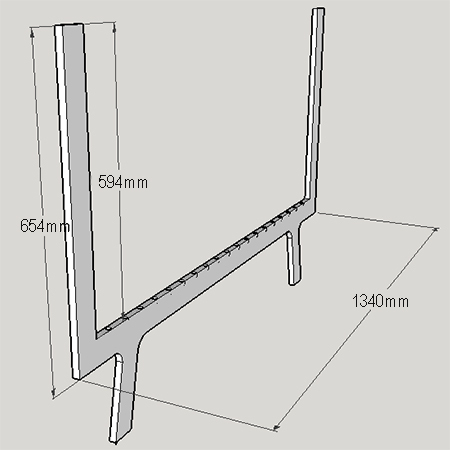 Measure and mark at 49.6mm and plus 12mm for the dowel, repeating this all the way along for mounting the rails. There are 19 dowels per side. 4. Repeat the measuring and cutting on the underside of the top frame. 5. Place the front and back frame on a flat, level surface. Use Pattex No More Nails adhesive to secure the dowels into the bottom section of the frame. Use a carpenter’s square to make sure the dowels are straight before leaving overnight. Don’t be stingy with the adhesive. Squeeze into the drilled hole so that a small amount oozes out of the sides when you push in the dowel. Wipe clean to remove any excess adhesive. 6. 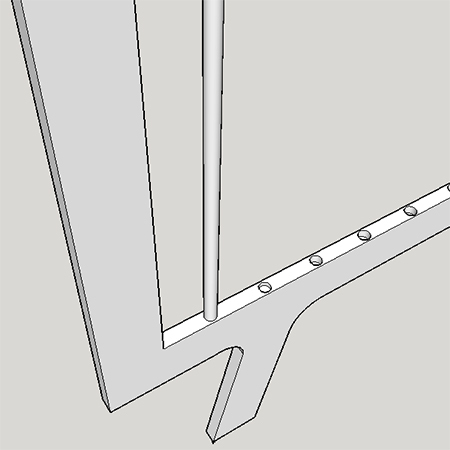 Place adhesive in the drilled holes in the top frame and place this on top of the bottom frame. Apply a bead of adhesive along to top of the sides on the bottom frame. Make sure the two sides are firmly together before leaving overnight. 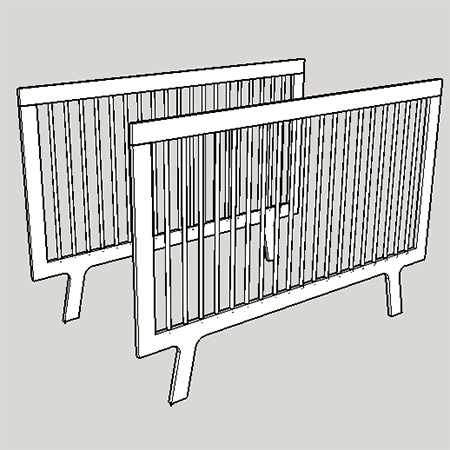 Now you have two complete sections for the front and back of your cot or crib. 7. Now you are ready to attach the sides of the crib. You have several options here: you can use biscuits or dowels, a pockethole jig, or you can drill 3mm pilot holes (countersunk) through the front panel and into the sides. The countersunk holes can be filled with wood filler and sanded smooth when dry. 8. 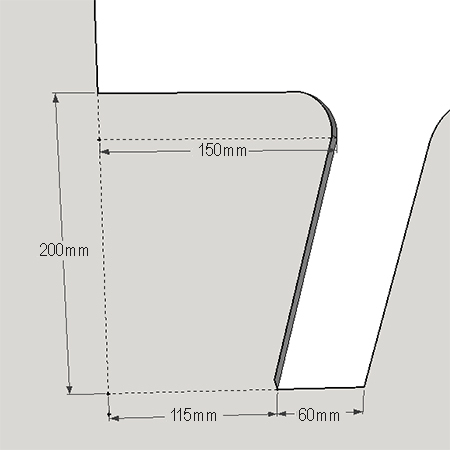 Measure up and mark 18mm from the bottom of the cut section of the front and back frames. 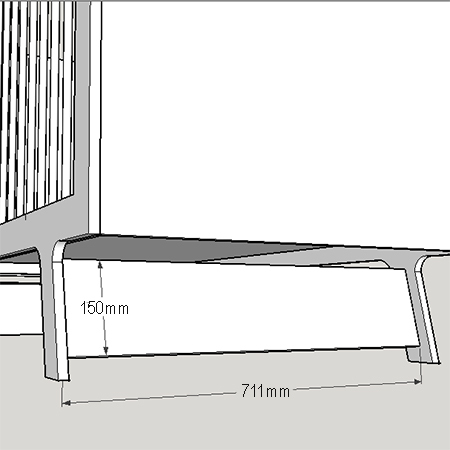 Use this as guide for mounting the side, front and back battens to hold the base in place. Secure the battens with adhesive and screws. 9. 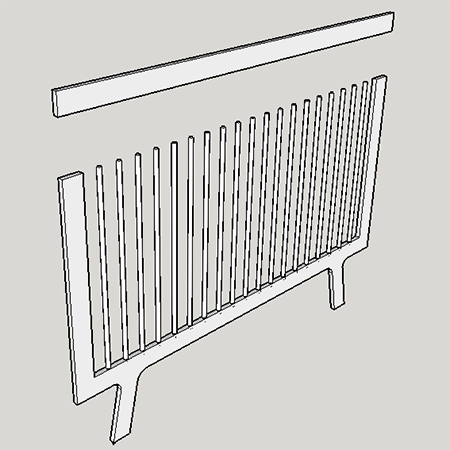 Insert the base so that it rests on top of the battens. If you need to raise the height of the base add side battens higher up the sides. 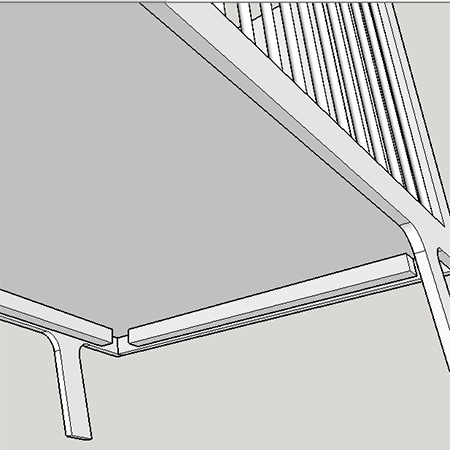 NOTE: If, after assembly, you find that the crib needs additional stability, or as your child starts to become more active, add a couple of stabilising crossbars between the legs as shown above. DIY project brought to you by Home-Dzine.